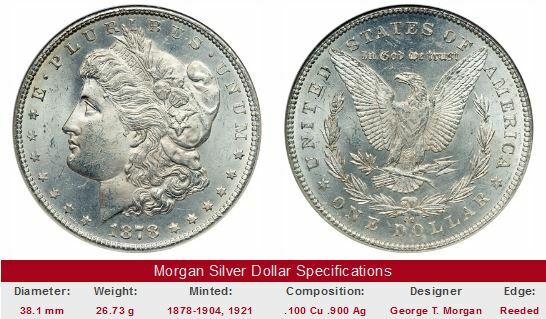 Welcome to the first page of tables for Morgan Silver Dollar values. You will find data on past and present Morgan Dollar values. Price movements from 1950 to the present for individual dates in this popular collector series are reported. The tables are structured to help collectors sort out those Morgan Silver Dollars which have demonstrated the strongest percentage gains over a long period of time. These same coins are the most likely to do well in the future, thanks to consistent demand from collectors. The links below are set up to help numismatists easily navigate through the Coin Value Tables. There is one table for each and every date, covering a range of grades, from Fine to Proof. If you're looking to isolate the key dates quickly, we recommend you pay a visit to our analysis of Morgan Silver Dollar values, where dates having the strongest records of appreciation are summarized. The analysis page also has a write up on the Morgan Dollar history. Try to think of coin buying as more than just hoping to make a good return on your money. There is so much more to study and enjoy. On top of that, you'll discover that with greater knowledge in the arena of numismatics, the more adept you'll become at picking coins destined to rise sharply in value. We have similar pages on many other US coinage types. Return to the Coin Value Tables online report listing to select another coin type for review. You can also see this list by clicking "Get Historic US Coin Values" located in the upper right hand corner of this page. The 70-point numeric system (G-4, VG-8, etc.) in widespread use today was popularized by the American Numismatic Association in the late 1970s, an era when coin values were escalating dramatically, most notably for high quality specimens. Vague descriptors such as "Choice" and "Brilliant" were replaced by the more precise numerically determined grades. Thus, finely differentiated grades like MS-60, MS-63, and MS-65 eventually became commonplace, and by the late 1980s, the practice of assigning a numerical grade to indicate quality was universal (this does not imply the 70-point system eliminated grading inconsistencies, but it did help to stabilize the coin collecting hobby). Because of their popularity, Morgan silver dollars were amongst the first coins widely subjected to numerical grading. The Coin Value Tables™ trend data for Morgan silver dollars reflect the historic availability of numeric grades to describe coins. For the 1950-1975 rows, the values in the "G-4" column correspond to the "Good" listing of those years, "VG-8" corresponds to "Very Good", and so on. The "MS-60" column records the "Uncirculated" value reported during those same decades. Similarly, "PF-65" corresponds to simple "Proof" figures. Starting in the 1980 row, coin values strictly correspond to numeric grades grades, including "Uncirculated" grades "MS-60", "MS-63", and "MS-65". Beginning in the 1980 row and onward, the "PF-65" figure can be precisely viewed as the value for a Proof dollar ranking 65 on the 70 point scale. An important Morgan silver dollar grade modifier is the "Deep Mirror Proof-Like" phenomena. An extremely scarce quantity of dollars are sharply struck with highly reflective, proof-like surfaces. Abbreviated "DMPL" by most price guides and affectionately termed "Dimples" by Morgan aficionados, these coins are indeed rare and usually carry hefty premiums. Never purchase a "DMPL" dollar unless it has been certified by a major grading service.